There were no recordings available during the Big Music Tour until this retrospective compilation was released later in the year. The tracks were selected from different shows recording during the whole tour. It isn't known where each individual track was recorded. The tracks were chosen to give a taste of the tour, and to showcase the latest Big Music album. The selection was also compiled to provide a balance with the more 'greatest-hits' orientated Celebrate - Live At The SSE Hydro Glasgow which was released the previous year. Billy Sloan exclusively played some of tracks on his BBC Radio Scotland show on the 17th October.
" Simple Minds are primarily a live band and most of our career has been spent criss-crossing the globe playing literally thousands of shows. It is therefore in concert where somehow the essence and spirit of Simple Minds is at its strongest. We grew up on stage, it is our natural habitat, we feel better there than anywhere else. But it is also in the live situation where the real connection is made with our audiences - who themselves play a big part of any Simple Minds show as we feed off their energy and enthusiasm. " " To document that, especially as the band still continues to evolve is indeed important to our story. But it is also interesting in that just as each Simple Minds album is different from the previous, likewise no two Simple Minds tours are the same. The best way to document all of that is to record the shows. This we do as we go along from gig to gig, in doing so we also start to create a distilled souvenir that we hope many who come to our shows value. That is what lies beyond the urge to release live material, that is why it is important. " These days many fans who go to shows make their own souvenirs and we see that all over Youtube etc. as their clips and photos are posted.
" Yes they do. And that is both understandable and fine. But - and there is a but - rarely does that stuff sound any good, and rarely does it capture to any full degree what the evening was really about from an overall audience point of view. The production and mixing on this release is all under the control of our live sound engineer GG, and what you hear is what he hears, as he works with our sound in concert halls the world over. He does an amazing job of capturing what we put out, this has to be said. " " Much as we like our recorded work in general, the fact is that it is not until you take songs out and play them night after night in front of a live audience that you really find out what truly lies at the heart of a song - or indeed how good it is? Songs are honed live, they grow live also as arrangements can be more expansive, or shorter even, as they morph into some other tune altogether. Certain songs were seemingly written to be played live especially, while others might be too fragile to cope with the live bombast. Like wild horses - live is in the end where the songs are finally set free of the studio constraints. Played live is where they become powerful shots from heart, aimed directly to the front row and reaching all the way to the back of each and every venue. " How "live" is this recording - is there any additional post production work involved. Things that are added to make a more polished product?
" This is 100% live without any additional recording whatsoever. This is warts and all! 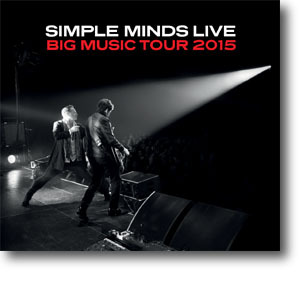 Nothing is diluted - this is the true sound of Simple Minds live recorded as it was on the night. " The release was only physically available from the Simple Minds Shop. It was later reissued as a limited edition red-vinyl LP for Record Store Day 2016.